Americans who love gummy bears have a new way of enjoying their favorite candy! 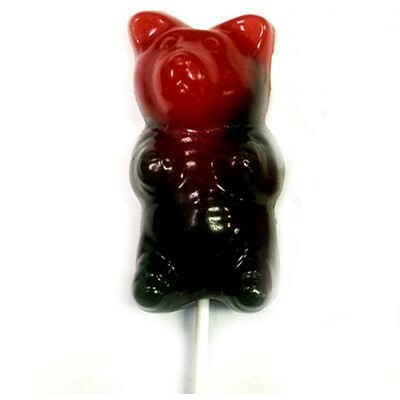 Made up of two delectable flavors (strawberry / blue raspberry or cherry / green apple, chosen randomly), the Ginormous Gummi Bear is almost 100 times bigger than the average Gummy Bear and eaten on a stick just like a lollipop! If you love Gummi Bears, then you'll surely love this Giant Gummi Bear on a stick. Corn syrup, sugar, gelatin, humectant E420, dextrose, acidity regulators E330-E331, pectin, artificial flavors, glazing agent E903, colors E129*-E133. May have a laxative effect on sensitive individuals. *May have an adverse effect on activity and attention in children. Contains GMO. Nutrition facts (for 100g): calories 357Kcal, total fat 0.9g (saturated fat 0g), total carbohydrate 78.6g (sugar 53.6g), protein 5.4g, salt 0.1g.